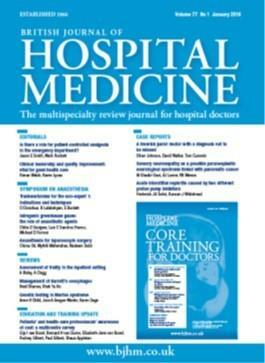 British Journal of Hospital Medicine is the leading monthly multi-specialty review journal for hospital doctors. The journal has been at the forefront of medical education for over 45 years, publishing only the best and most authoritative clinical reviews, symposia, editorials and case reports available to doctors. • The Core Training for Doctors section: Intended to provide clinical information in an easily accessible format to doctors in training. Articles cover clinical skills for postgraduate examinations, what you need to know about, tips from the shop floor and what they don't teach you in medical school. British Journal of Hospital Medicine covers all specialties in hospital medicine, making it essential reading for doctors of all grades who want to ensure that their practice is evidence-based and up-to-date with all the latest clinical developments. The journal's articles are concise, fully referenced, presented in an easy-to-read format and peer-reviewed by some of the world's leading international authorities. Be the first person to tell us what you think about British Journal of Hospital Medicine and you'll save £2.50 on your next purchase!